For Immediate Release: Posted On 2/21/2012 By Industrial Magnetics, Inc. The Low Profile Transporter® LP magnetically transfers metal blanks, stampings and parts in automated station to station, press-to-press transfer, robotic pick and place, or lift-assisted applications and is capable of handling odd shaped or perforated parts, operating in any orientation and uses up to 95% less air than traditional vacuum cups. 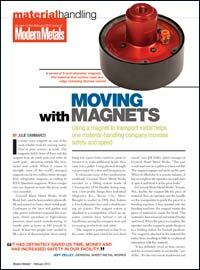 The article details how IMI’s magnetic Transporters® were used at General Sheet Metal Works, a high-volume precision sheet metal manufacturer, to increase productivity and worker safety in the production of a heavy metal part. GSM’s Jeff Zelly, states, "It has definitely saved us time, money and has increased safety in our facility".